What’s in a name? That which we call a rose by any other name would smell as sweet.” You may remember this famous line from Shakespeare’s Romeo & Juliet. Shakespeare didn’t know anything about marketing. What’s in a name? Everything! That’s why we named our new printable heat transfer film “CozySoft Print”. The name Logical Color CozySoft Print promises quality, value and a super soft hand. We were going to call it ‘FluffyBunny PRINT’, but that was already taken. Just kidding. So why did we pick such a precious name? Were glad you asked. Logical Color CozySoft PRINT is a digitally printable heat transfer film. There’s no PVC here, so it’s not really vinyl. But if you want to call it printable T-shirt vinyl, we won’t argue with you. CozySoft PRINT is a premium 2 mil (50 micron) Polyurethane heat transfer film with a satin finish. It is so named because, when applied to garments, it has an astoundingly soft hand. You can barely feel the applied graphic. Yet it’s opaque enough to be used to decorate dark apparel. Speaking of apparel, use CozySoft PRINT to customize cotton, 100% polyester, cotton-poly blends, acrylic and similar fabrics. That covers the cozy soft part. What about the print part? 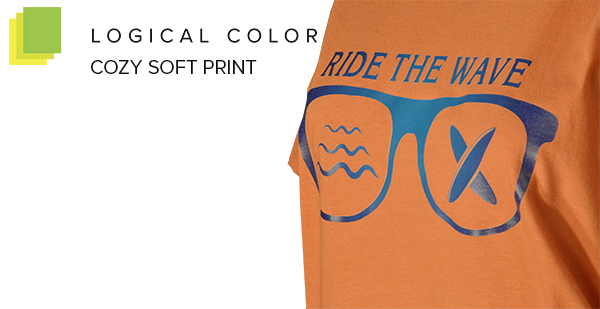 CozySoft PRINT is engineered for use with large format solvent-based inkjet printers. PrismJET printers using EnduraINK PRO, MUTOH ValueJet Printers running Eco Ultra, Roland and Mimaki printers are all compatible. CozySoft PRINT is also certified for use in HP Latex printers, so we have all the bases covered for industrial grade t-shirt printing. Print quality is excellent so your CozySoft PRINT appliqués will be just as pleasing to the eye as they are to the hand. Logical Color printable films are engineered for use in a print and cut workflow. You’ll need a large format eco-solvent or Latex inkjet printer, a vinyl cutter, software to manage the process, and of course, a heat press. That’s the hardware list. The only other consumable you need is a roll of heat transfer tape. Once you have all that rounded up, you’re ready to go. Here are the application instructions. • Design your image right reading. • Set your pre-heater, platen heater and dryer temperatures to 42°/44°/50°. • Contour-cut with a 45° blade using approximately 70 grams of force. If you’re using a Vinyl Express Qe6000 or Q Series, start with the force setting around 12. Cut and weed a test pattern and adjust as needed. • Weed away the excess film. Cover with high-tack heat transfer tape. Use a good squeegee with firm pressure. • Remove the clear polyester release liner and place the masked image tacky side down on the garment. If you have trouble with this step, grab the liner and pull it off quickly and forcefully. • Set your heat press for medium to firm pressure and press for 15 seconds @ 320°F (160° C). • Peel the tape warm. How Wide, How Long, How Much? Logical Color CozySoft PRINT comes in 20″ and 30″ widths. We offer it in 15, 30, and 81 foot rolls. There are good options for everyone from Mom & Pop shops to busy decorators. Prices start at only $47.99 for 20″ x 15 foot rolls; a fair price for outstanding performance. While you’re ordering your CozySoft PRINT, don’t forget to grab some ATT600 or Siser TTD High Tack Mask. And a Teflon sheet. And a weeding tool kit. And a new printer. Okay, you may not need that last item. If Juliet were to ask Romeo today, “What’s in a name?”, he might say. “Everything! Have you tried that new Logical Color CozySoft PRINT? Verily, t’is soft as a bunny’s ear!” I’m sure that’s the way Shakespeare would have written it if he’d had a heat press. Just how soft is CozySoft Print? Order a roll and see for yourself.